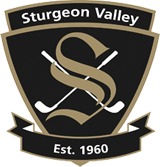 Sturgeon Valley Golf and Country Club History The Sturgeon Valley Golf and Country Club was established in 1960 and is located north of Edmonton and east of St. Albert in the Sturgeon County. The current course borders the Sturgeon river on the northwest and Sturgeon Road on the southeast. Events Sturgeon Valley Golf and Country Club can customize for any event! We can host outdoor events during the summer, indoor events for up to 150 people throughout the year, and ready to serve up exquisite cuisine whenever you're ready!